Place a sheet of puff pastry on a lined baking tray. 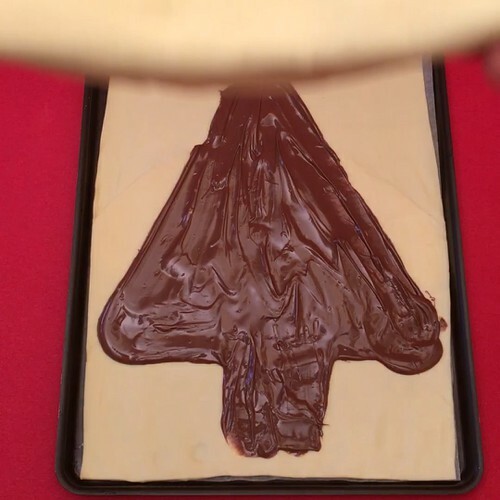 Draw on the puff pastry the shape of a Christmas tree in Nutella®. Cover the first pastry sheet with a second sheet. Cut the pastry leaving the outline of the Christmas tree. Cut strips about 1 cm apart on either side of the tree, leaving a 2 cm strip attached to the middle. Draw a trunk in the center with the tip of a knife. Twist each strip over a few times to make 'twists'. In the spare pastry, make decorations for the tree. Brush the Christmas tree with egg yolk and bake for 25 minutes at 180°C. Sprinkle the tree with icing sugar and use candies to make baubles and decorate the tree. Serve with whipped cream.